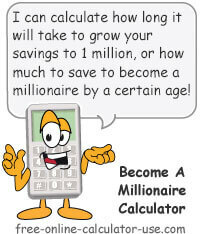 Become A Millionaire Calculator: How Long Will It Take? Enter your current age. The calculator will use your current age to estimate how old you will be when you reach your 1 million dollar savings goal. Enter the age you would like would like to have 1 million dollars in your account by (retire age, etc.). If the calculated results don't show you becoming a millionaire by your target age, the calculator will tell you how much you would need to deposit in order to hit your target. Enter the current balance of your savings account, or the initial deposit that is not part of the periodic deposits (without dollar sign or commas). If you have no current savings, enter a zero. Enter the average percentage rate of return you expect to earn on your investments. Enter as a percentage but without the percent sign (for .02 or 2%, enter 2). Based on your entries, this is number of years it will take until your savings reaches 1 million dollars. Based on your entries, this how much your savings account will have grown to by the time you reach the target age you entered. Note that if your savings hits the 1 million mark before your target age, the result on this line will be "N/A". Based on your entries, this is the amount of the periodic deposit you would need to make in order for your savings to reach 1 million by your target age. Note that if your savings hits the 1 million mark before your target age, the result on this line will be "N/A". This calculator will calculate how long it will take you to become a millionaire based on your present savings balance, the interest rate you expect to earn, and on how much you can afford to save at your chosen interval (weekly, bi-weekly, semi-monthly, monthly, bi-monthly, quarterly, semi-annual, or annual). Plus, if the amount you can afford to save won't get the job done by your target age, the calculator will tell you how much longer it will take, along with what periodic savings amount is needed to become a millionaire by your target age. Enter the age you wish to become a millionaire by (retirement age, etc.). Enter the amount you currently have saved toward becoming a millionaire. If none, enter 0 or leave blank. Enter the average percentage rate of return you expect to earn on your savings. Click the "Calculate MillionCalculate Millionaire StatsCalculate Millionaire StatsCalculate When You Will Be A Millionaire" button. This will display the future value at your target age, the years it will take to become a millionaire, and a year-by-year savings growth chart. Becoming a Millionaire Is Easy … Not! Someone once told me that becoming a millionaire was easy. They said all I had to do to was to figure out how to get one million people to each send me a one dollar bill. If I did manage to get one million people to send me a one-dollar bill, and I could process one envelope every 10 seconds, it would take me 2,778 hours just to process the envelopes. That's the equivalent of working 69 40-hour workweeks (1.3 years). If it took me 20 seconds per envelope, that's two and a half years of work just to process and handle the mail. At just $15 per hour, that's a labor cost of $83,000 – plus payroll taxes. The 1 million envelopes (5 grams each) and their enclosed dollar bill (1 gram each) would weigh in at approximately 6,000,000 grams, or 13,228 pounds (6.6 US tons). Plus, given the thickness of an envelope with a dollar bill enclosed, my stack of mail would initially measure 1,075 feet high. That's the equivalent to the height of a 90 story building! So, since I don't have an unused 280 cubic feet of extra space that would support 6.6 tons of mail, I would need to rent a storage unit to store my mail in for the time it would take to process all of it. Considering the average conversion rate of a marketing campaign is 1%, that means I would need to present my sales pitch to one-hundred million households in order to get one million of them to send me one dollar. That's 80% of the total number of households in the US! Depending on which medium I used, marketing costs would run somewhere between $25,000 and $3,200,000 ($0.25 per 1,000 contacts for Facebook ads to $32 for newspaper ads). But considering I'd be offering nothing in return for the one dollar (plus the cost of the stamp and envelope), my conversion rate would probably be far less than 1%. This would further increase the marketing costs. So even if I used an online payment service (PayPal, etc., which would charge me a processing fee), the cost to deliver my sales pitch to enough people to find a million of them to send me one dollar would eat up most, if not all, of my revenues. Trying to get a million people to send me one dollar would likely cost me far more than the million dollars I hoped to get in return. Given the current savings account interest rates (.5%-1%), and how difficult it is for the average household to save any money at all, most of us probably won't live long enough to see our savings grow to a million dollars. Yes, most of us will earn a million dollars in our lifetime (see Lifetime Earnings Calculator), but marginal tax rates, low saving rates, and the out-of-control health care and health insurance costs all make it extremely difficult for the average household to make ends meet, let alone have anything left for saving to become a millionaire. In my experience, most households are not even saving enough to cover the repair and replacement of their depreciating assets. Everything we own that can wear out or become obsolete, is doing so every minute of every day. So if we're not setting aside enough to repair and replace everything as it wears out or becomes obsolete, there's a good chance that our savings will eventually fall victim to "emergency" repairs and replacement. Or worse, if we have no savings at all, we will be forced to take on even more debt. Furthermore, in order to deposit money to our savings, we first have to earn it. And that means that we also have to pay the marginal income tax on the money we earn (the more we earn, the less of each additional dollar we get to keep). So if you are in the 25% tax bracket, and you wish to make a $500 deposit to your savings account, you will actually need to earn $666 in order to have $500 left after taxes. Even if we defy the odds and somehow manage to grow our savings account to a million dollars, inflation will have probably diminished its buying power down to about $400,000 (based on a 2.4% average inflation rate over 40 years). And suppose you do end up with $400,000 worth of buying power in your savings account. If it required you to spend 3-4 decades of your lifetime slaving away at a work that brought you little to no joy or fulfillment, would it even be worth it? Not for me it wouldn't. I stopped focusing on chasing after money years ago, after discovering that setting and striving to achieve monetary goals had led me away from happiness, not towards it. After years of continually focusing on making more money (become a millionaire, etc. ), only to end up trapped by debt in a work I hated, I eventually came to realize that my happiness had little to do with how much money I earned or accumulated. Instead, my happiness comes from being free to decide how I spend my life's most precious and limited resource – my time. Or, as it relates to work, being free to use my own creative self-expression to help others to avoid, minimize, or solve a problem that's important to me. Sure, I do need an income to support my family. But I certainly don't need a six-figure income – or a million dollars in the bank – to do that. Besides, it's not how much money we make that matters, it's the size of the gap between our income and outgo. If you're making a million dollars year ($479.48 per hour at 40 hours per week, via the Annual To Hourly Pay Calculator), but your annual taxes, expenses and debt payments also add up to a million dollars, then you're still left with the same amount of discretionary income as someone who is making $10,000 a year … zero. For this reason, instead of focusing on how much money I make, I focus on increasing the size of the gap between my income and outgo. You see, the wider the gap between my income and outgo, the more I can afford to work at what makes me happy, regardless of how much that work pays. The wider gap also means I can set aside more money to insure I can continue to work at what makes me happy – even through the lean times. Work to increase my income. In my experience, working to lower my expenses and debt payments is much easier and far less stressful than trying to increase my income. I'm sure you'll agree, if you work 40-60 hours per week at a stressful, unfulfilling job, it's going to be very difficult to offset that amount of unhappiness outside of work. For this reason, I prefer to chase after a work that I enjoy and believe in, first. Then manage my finances so I can live within whatever means that work provides. The cool thing is, when you discover a work you enjoy, are naturally good at, and helps solve a problem that's important to you, you may just find that the money chases after you. Plus, because you love and cherish your work, you will automatically become better at managing what money you do make. Because once you experience the joy of being fully engaged in a work you love, you will naturally do whatever it takes to make sure you can keep doing it. Step #1: Choose a widespread problem that's important to you. For me, it was helping others to maximize the emotional profits from the money they earn. Step #2: Find unique ways (products and/or services) to help others to avoid, minimize, or solve the problem listed in step #1. Ever since being introduced to them, I've been fascinated by interactive spreadsheets (Excel, Open Office Calc, etc.). So I started out by creating financial self-help spreadsheets, which I later converted to web based spreadsheets (online calculators). Step #3: Choose a spot within the problem solving process that best suits who you are, what you believe in, and that allows you the most creative self-expression. As in introvert who enjoys working in solitude, I chose to build a website to deliver my "products" to the people I want to help. I then enlisted the services of an ad serving company to sell ad space on my website. Since I don't want to become a financial burden to the people I'm trying to help, my "customers" get to use the self-help calculators for free, while I earn my income from ads that display on the website. Step #4: If possible, start small, grow slow, pay as you go. I started with a computer, an internet connection, and a $29 per month subscription to SBI (a complete online business building system), and have since built my business income and rainy day fund to a very comfortable level. By following the 4 steps to emotional wealth, even if you fail to ever reach millionaire status, at least you will eventually discover a work you love and believe in. That's something most people never do discover, because they are too busy chasing after more money.